This is a how-to book for the academic life based on more than 50 years combined personal experience and 8 years of formal group mentoring as part of a workshop on these topics. The unwritten rules of university life are shared through fictional vignettes that are all too real. Secrets to successfully achieving short-term and long-term goals are provided in the progress timelines and suggested milestones. Beginning with selecting a training program and choosing a job, this book takes the student, fellow, or faculty member through the maze of academic secrecy to a new level of understanding and empowerment. 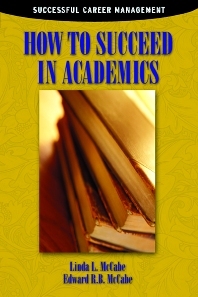 Provides the unwritten rules for success and "tells it like it is"
Undergraduates, graduate students, medical students, medical residents, postdoctoral fellows, and faculty members interested in developing a career in academia, particularly those in the sciences and medicine; serves both the individual reader and as a text for workshops on career development. Preface. Introductory Overview: Establishing Personal Goals and Tracking Your Career. Selecting a Training Environment: Choosing a Training Program, Training Institution, and Mentor. Selecting a Position in Academia: Choosing a Department, Institution, and Mentor. Selecting Grant Opportunities: Understanding the Organization of the NIH, Other Governmental Entities, and Private Foundations. Writing a Grant: Selecting the Specific Aims, Preparing the Budget, and Developing the Research Proposal. Grant Review: How Review Groups Work, Responding to the Reviewers' Feedback, and Preparing the Revised Application. Preparation of Abstracts for Scientific Meetings. Presentations at Scientific Meetings: Preparation of Effective Slides and Posters. The 10-Minute Talk. The 1-Hour Talk, Including the Job Application Seminar. Selecting a Journal: Instructions for Authors, Recommending Reviewers, and Submitting the Manuscript. How to Write Research Papers. How to Write Review Articles and Chapters. Manuscript Review. Ethical Behavior. Leadership. Preparing a Curriculum Vitae. Summary: Gauging Success. Index. University of California, School of Medicine, Los Angeles, U.S.A.